Modern imaging services have come a long way since their humble beginnings, giving today’s radiologists a wide range of tools to help deliver a higher level of health care to their patients. From MRIs to CT scans and more, services such as diagnostic imaging are helpful in finding and diagnosing medical problems with precision. Medical imaging services are often lifesaving measures, helping to create clear visuals for physicians who need a closer look at what is going on within the body. If you have been searching for quality imaging services in Pittsburgh, our ACR board-certified radiologists are here to help. North Pittsburgh Imaging Specialists is proud to be your Top Rated Local® medical imaging providers, delivering affordable services and working with our patients for a beneficial outcome. Many of our imaging services center around producing a static image of the structures within your body. Fluoroscopy is one X-ray approach that emits a beam to provide a live feed of moving images. 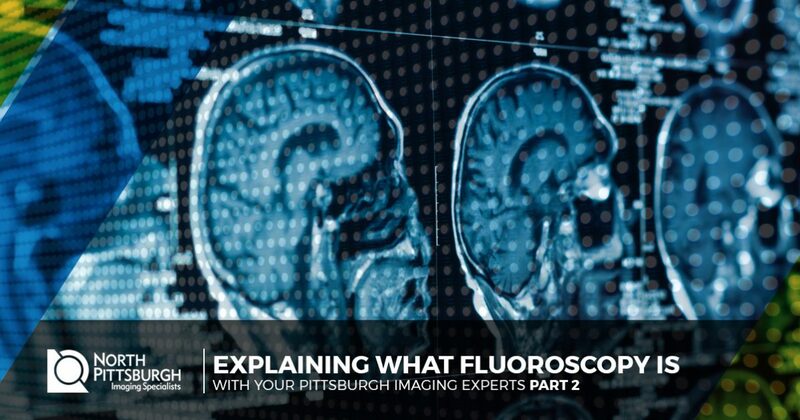 Today, we’ll continue to discuss the value of this service by highlighting a few more uses of fluoroscopy. If you’re in need of affordable imaging services, be sure to reach out to our experts for an appointment. This imaging exam can be very helpful on its own for diagnosing problems, locating foreign bodies, and aiding in injections to the spine and joints. Lumbar punctures. Also known as a spinal tap, this procedure relies on inserting a hollow needle into the lumbar area of your spinal column. Lumbar punctures are used for a wide range of diagnostic and treatment services, and require precise movements for an optimal outcome. Myelograms. This procedure is used mainly to diagnose issues within the spine. A contrast dye is inserted into the spinal column to illuminate the different structures surrounding your spine. Upper gastrointestinal examinations. Seeing how your esophagus, stomach, and small intestine operate can be very helpful in diagnosing different issues. Radiologists can utilize a fluoroscopy scope to spectate barium as it is ingested by the patient. Catheter insertions. Placing cardiac catheters properly requires precision for the best results. Fluoroscopic images can help to illuminate different structures of the body to minimize problems. Blood flow studies. Abnormalities with blood vessels and other cardiac complications can be hard to diagnose with static imaging services. Fluoroscopy procedures can help to record the movement of blood through the body. Orthopedic surgery. Between advancing percutaneous techniques and locked intramedullary devices, fluoroscopy has become more useful than ever for delivering a clear image for surgical operations. There are many fields that fluoroscopic video can be very helpful in increasing accuracy and minimizing costly errors. While this diagnostic medical imaging technique can be very beneficial, radiologists will need to take steps to ensure that you are exposed to a minimal amount of radiation. If you are in need of affordable medical imaging of any type, it’s important to find a provider that has the experience and modern technology needed to create the best approach for your health. The North Pittsburgh Imaging Specialists staffs your local radiologists, on staff around the clock to deliver the best support. As Pittsburgh’s imaging service experts, we’re available for appointments and will work with our medical coverage to create a beneficial care plan. Contact us today to learn more about our practice.